We all know people—individuals we grew up with, our friends, co-workers or people we’ve simply come in contact with. 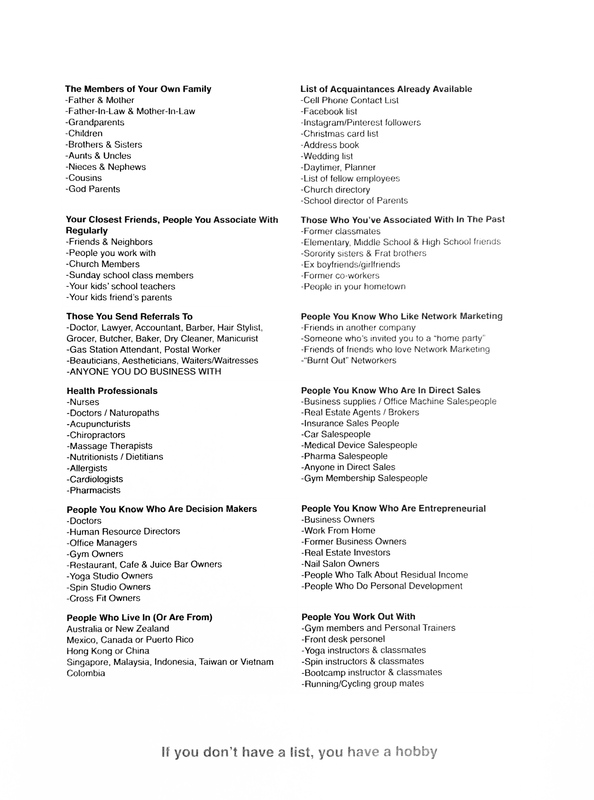 As time goes by, you will constantly be adding to this list through referrals, new contacts, remembering old acquaintances, etc. Never PRE-JUDGE anyone while compiling this list. Don’t worry about whether they will be interested or not. Even contacts that do not get started will be a great potential source of referrals! This exercise is meant to put everyone you know on paper and over time help them learn about Isagenix & The Breakthrough Movement. Remember: The ones you think will, won’t. The ones you think won’t, will. The ones you think can, can’t and the ones you think can’t…absolutely CAN! Some will, some won’t…leave your emotions about it out of the equation. Circle the names on your list who have the character traits / core values you wrote down in Step One. Print out the Memory Jogger and Referral Sheet to help you with your initial contact list. Your list should have a minimum of 50 people and it is recommended you complete it within first 24-48 hours. When you go over your list with your coach, he/she will guide you on how to reach out to your contacts. Look below for examples on Isagenixbusiness.com on how to connect with your product user prospects and business prospects. On our first scheduled call we will discuss your income goals, your “Why” and your completed “Memory Jogger” list. We will also go through the New Associate Interview. This will empower you on your journey and set the right expectations for what’s ahead. Highlight your short and long-term goals and be prepared to discuss WHY you are doing this business and how the income you will earn will change the quality of your life. Order the Eric Worre “Go Pro” book. This book is necessary to understand Network Marketing and how to become a Pro! Plug into the WEEKLY Team Training calls right from the start – These calls are extremely important for your success. Please add them to your planner and program the call numbers into your phone. * Mondays at 9:30 pm (EST) – Healthy Body Team System Training Zoom. Link posted in HBT Facebook page each week. Tuesdays at 9:30 pm (EST) – Healthy Body Team Call Leadership Mentoring Zoom Webinar. Link posted in HBT Facebook page each week. BEGIN TALKING TO YOUR LIST! YOU: Hey, I have something really exciting I want to share with you & a question I’d like to ask you...do you have 5 minutes to chat? YOU: “Great, calling you now.” (IF ‘I can’t right now’) “No worries, when will you have 5 minutes to chat? YOU: Great, on ________ day, I can do either ______ or ______ which works best for you? I’m calling you for a reason and let me start by saying that one of the main reasons I’m calling you is because you’re one of the most ______, ______ and ____ people I’ve ever met & I just think the world of you. The reason I’m calling, is a few days/weeks ago, etc my friend _______ introduced me to an amazing Global Health & Wellness Company called Isagenix. I’ve only been using the system for _____ days/weeks/months and have already experienced _____, ______ and ______. When I looked at everything more closely, I realized that this is an incredible financial opportunity and the products happen to be amazing too. So, when I asked myself the question: ’Who do I know that is/has ____, ____ and ______ ? (i.e. into health & fitness, entrepreneurial, great at sales, the midas touch, etc)? Naturally, you were at the top of my list. Now, I know you (love your job or are really passionate about your business or already have so many irons in the fire already, etc). I’m going to run with this and I think you’d absolutely crush it too. Ultimately, I have no idea whether or not this will be for you…but if it is, you’re going to be really happy I shared it with you. Would you be open to taking a look and learning more about it? Them: Well sure, can you tell me more? THEM: That sounds great! I’m available tomorrow morning or evening. YOU: Ok, awesome. Let me confirm with _______, which of those works best, he/she is super busy. YOU: K, we’re all set for ___ (time). Before we hop on the call, there are a couple of brief videos that provide some context for our conversation, if I sent them to you a few hours before we chat will you watch them for sure? They’re less than 10 mins. YOU: Great should I send them through FB or Email? YOU: K, will do. What’s the best # to reach you on for our call? AND THAT’S IT! DO NOT CONTINUE THE CONVERSATION PAST THAT! 2nd: Go to Isamovie.com and check out the tabs on the home page. Look forward to chatting with you on/at (enter appointment time). Copyright © 2019 Spark Trainings - All Rights Reserved.